This is the fourth and finally Bridge Tally card from this set! 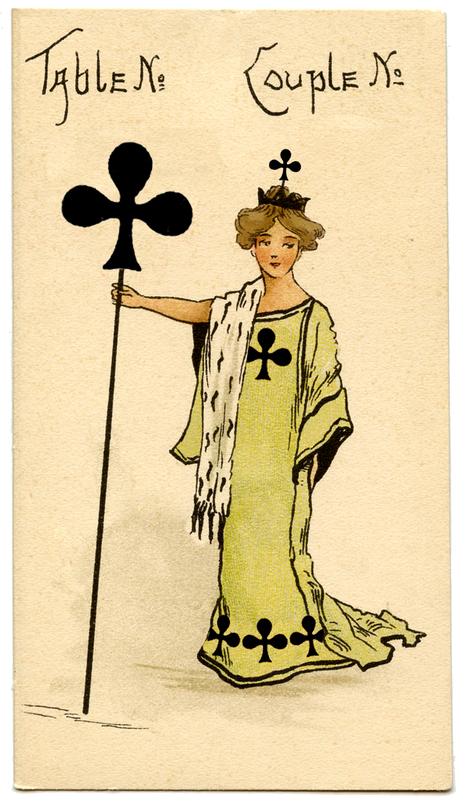 This one shows the Queen of Clubs. I actually did not have a Club Card for this set, so I created this one for you, using one of the other cards in the set. I hope you like her! You can find her friend the Queen of Diamonds Here.. I believe these date to the early 1900s. Free Vintage Card Deck Clip Art! Vintage Postcard – Actress Glamour Girl – Gladys Cooper Vintage Ballerina with Roses Image! Thank you, thank you, thank you! I love these vintage ladies!!!! I’m tickled to have the whole set! wow, they are beautiful, your are so talented!!! I LOVE, LOVE, LOVE these!!! Thank you!